What's libgdx? It's a game/application development framework in Java. It allows you to write an app, and then run it on Android, on desktop and in the browser. Awesome! If you want to know more, read what its creators say about it. In this tutorial I'll show you how to run a game written with libgdx in your browser (as a Java applet). So why Minecraft, you might ask - well, Minecraft runs as an applet! (and it's written with Lwjgl - more on that later) And talking about Minecraft is so snazzy these times, you know. I'm going to use libgdx's "Hello world" as an example "game". I won't cover setting up the project here, Mario (father of libgdx) did it already here. Now you're using Lwjgl as your backend! All the cool kids use it, so you can consider yourself as cool too. Cool, eh? 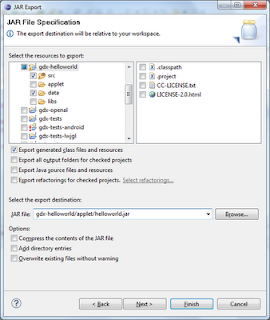 lwjgl_util_applet.jar - this is the actual applet launcher. The Lwjgl guys made a sophisticated tool for that. It is configurable via an html file, which we will add in a moment. Get this launcher by downloading the latest Lwjgl distribution. It's 2.7.1 as I write it. 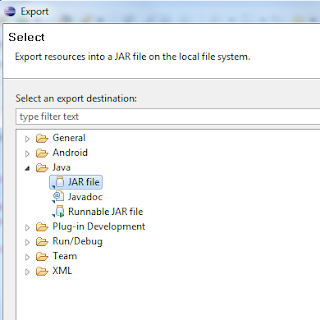 Copy lwjgl-2.7.1/jar/lwjgl_util_applet.jar to your applet dir. You can click "Finish" in this window. All the options are documented here. Now we've got everything we need! Open index.html with your browser and... it won't work. Why? This command will create a .keystore file, which will contain a single key named "gdxkey". I recommend setting the keystore password the same as your key password ("gdxpassword" in this case). After signing the jars fire up index.html again. Answer some security question and enjoy libgdx in your browser! If you're smart, you can write an Ant script for that. Obviously I am smart, but I'm also too lazy to do that. I recommend Amazon S3 for hosting purposes (I'm using it for Pixel Slaughter!, Minecraft's using it too), but you can even publish it in your Dropbox. I did this too with my example project. 39 Response to "Being like Minecraft (or how to run your libgdx app in web browser)"
Creating an applet version of my game was on my list, so you've saved me quite a bit of work figuring it out. Thanks. Thanks for posting this, I never made an applet before and wanted to share my libgdx project with some friends online. Now my project runs on my phone and in a browser. Thanks! Nice to hear this is working. May I request a jogl version, or why a jogl version is hard / not possible? Thanks! Currently you can do libgdx-powered applets only through lwjgl. it's still giving me a class not found exception, and i followed this tutorial to the tee. any suggestions? At which point do you get this exception? Please provide full stacktrace. When I tried this, I got this message. How can I troubleshoot to find out what is causing the error? Enable Java console in your browser to get the full error message and a stacktrace. I'm getting an invalid SHA1 hash exception for AppLoader.class$2. Any ideas? 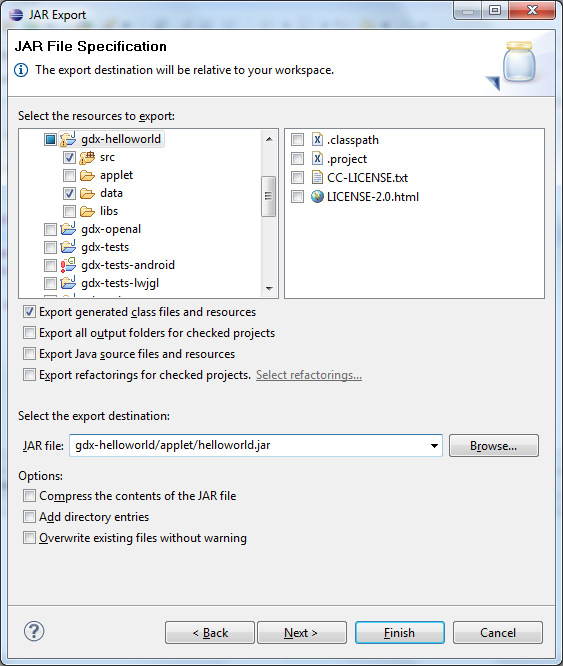 Did you put the AppletLoader jar inside the jar you exported from your project? Don't do that, they must be separate. @Thotep nope, I didn't do that. I get an error while "Extracting downloaded packages", how can I debug this? Turn on the Java Console. The certificate(s) in gdx-natives.jar do not match the AppletLoader! java.lang.Exception: The certificate(s) in gdx-natives.jar do not match the AppletLoader! You didn't sign it properly. All jars need to be signed with your certificate AND NO OTHER. I get the same exception for gdx-natives.jar - how is it possible that all the other jars get signed correctly and this doesn't? Go inside every .jar file (they're juest regular zip files) and remove the dir META-INF (if it exists). This will remove all signatures (including yours). Then sign them all again with your certificate. 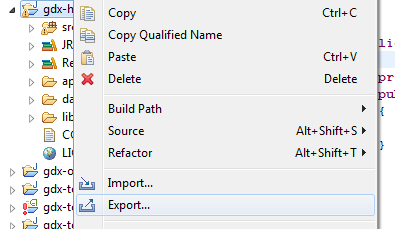 I cannot play my test project, and your example project has the same error. Any ideas? Great tutorial, helped me to port Space Squad (www.spacesquad.co.uk). Libgdx is amazing. I was trying to figure out the best way to deploy a test version. I came across this post which was pretty clear to follow. After a few personal tweeks I will respect your request to view the game! Thanks for this post! I'm having some trouble running the applet though, I think it has to do with the .jar that should contain the game. I'm using the setup as described here: https://code.google.com/p/libgdx/wiki/ProjectSetupNew . So basically there are seperate projects for the (core) game and its targets. For now I've added both the core project and the desktop project (which also contains the applet code) to the jar. The LWJGL-applet will start but hangs while "validating: gdx-backend-lwjgl.jar". Any help would be appreciated. Please read the comments above, the first thing you need to do is to check the exact error message in Java console. Any ideas? I would greatly appreciate it! Looks like you forgot to include gdx-natives. Where exactly do I need to include it? I have it in the index.html as well as in the applet folder. I built the project in the included project generator and am working in eclipse. Embedded, and Java Card and many more. technology, business applications in the cloud securely..
Nice blog. Thanks for sharing. See also this website about mspy phone tracker. Learn Complete How To Earn $500 Per Month By Mobile & Computer at home. Kilgamore Castle is now free!